Thousands of years of history are sealed in plastic boxes lining row upon row of shelves in the reserve Roman collection and archives beneath Corbridge Museum. The artefacts and archival material are boxed in a controlled environment that is monitored for pests, rodents and atmospheric pollutants. 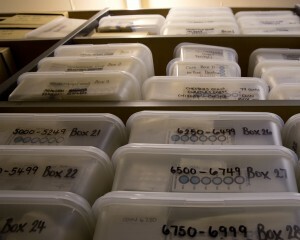 Metal items are kept in a series of plastic boxes each with its own paper apparatus for observing its internal climate. The row upon row of boxes look uniform except for the numbers and description. Taken as a whole they have an undeniable physicality that is clinical yet evocative. I have patterned my own archive after the Corbridge store, using the same plastic boxes, measuring apparatuses and complex numbering systems. It is comprised of all that is removed from the Wall, the museums, the sites and the archive in the process of stopping decay and the marks of the passage of time. The dust, leaves, rabbits, gorse etc were each removed by English Herritage to be be disposed of – I collected all. It stands as a monument to the unseen work done to hold back time.